After selecting one or two players (alternate goes!) play commences. You control a weird looking creature who wouldn’t look out of place on THE MUPPET SHOW!!! The game's viewpoint is interesting because it's set at a 45-degree angle. It takes a short time to accustom yourself to the control method because joystick movements cause diagonal movement of the player as opposed to the more traditional up, down, left, right. The game is set over a series of single screen levels, the objective being to colour all the blocks on that level a specific colour. 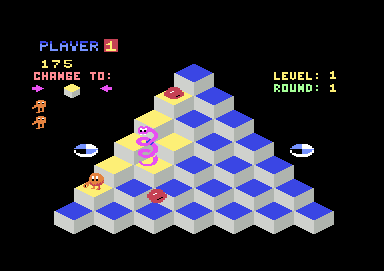 A miniature version of a block showing the required colour you need to complete the level is displayed at the top of each screen, there's also the relevant onscreen info like Score and Lives remaining. Apart from turning all the blocks a certain colour you must also dodge the enemies that appear from the top of the screen and bounce round the level trying there best to kill you, my favourite is the snake he looks cool! At certain places on the screen are 2 spinning disks, if you are trapped you can jump off the edge of the screen onto these (you can only use each disk once!) and you will be taken up to the top of the screen-a simple but effective idea! This is a real winner and like all the best games has had many clones. This for me however is THE definitive version. DISK VERSION - No difference between the Cartridge and disk, however with its age having this on Cartridge will make it a rare and collectable item - HUNT IT DOWN NOW!!! 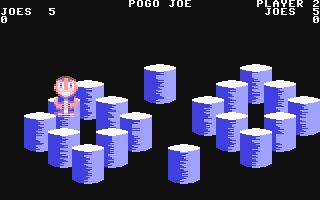 Of all the Q*BERT games I have played one stands out, POGO JOE is the game I'm referring to; although it contains many of Q*BERT's features it also adds many interesting bits of its own, the graphics are much larger and dare I say it, cuter than Q*BERT too! Who can forget playing this in the arcades? There were two versions of this; I remember the traditional stand up machine and the sit down, cockpit style version. The home conversion begins OK The appearance of the game initially looks promising. The game involves you dog Fighting Enemy Tie (Twin Ion Engine!) Fighters in Space, then you fly towards the Death Star shooting at the surface laser turrets, finally you fly down the Death Star Trench dodging the structures and laser turrets that fire at you! While the graphic-style of the arcade version has been captured well I think the biggest problem with this version is the flaw the programmers made using sprites, first of all the sprite animation frame update is VERY basic, ok. 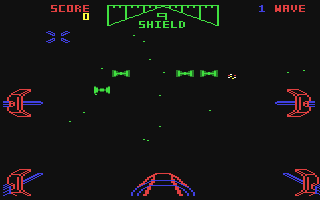 So this is a very early '64' game but even so the programmers could have used standard sprites then switched to expanded sprites to make the Tie Fighters seem to get larger. 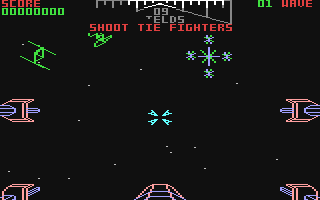 Secondly the game seems slow, half the fun of the arcade was the speed and smoothness of the game (The sit down version was better because it totally immersed you within the game- you REALLY did feel like you where flying an X-WING FIGHTER!). Finally sound is quite basic with a brief rendition of the Star Wars tune followed by the ubiquitous white noise sound effects early C64 games used to make - Sorry guys, no speech like the arcades!! !